Once again, Warwick School students are celebrating 100% pass rate at A Level with 57% gaining A*or A grades, exceeding last year’s results. Eleven boys scooped a clean sweep of A* grades, seven of whom achieved 4 A*s; Jack Chester, James Langley, Anson Lei, Ben Rhodes, Tom Steeley, Timothy Tam, Thomas Varnish. 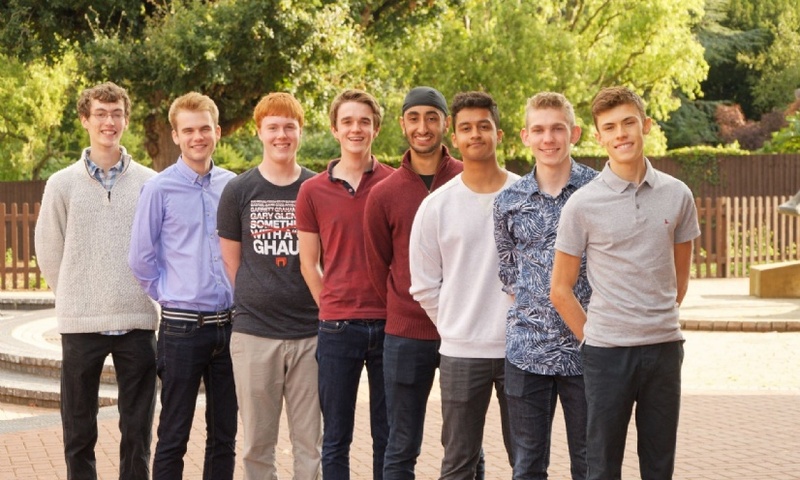 All eight boys who received Oxbridge offers have secured their A Level grades including Head of School, Oliver Layzell (A*A*A*A) to take up his place at Cambridge to read History. Warwick’s strength in the Sciences continues: in Chemistry, a notoriously challenging subject at this level, students achieved 79% A*/A grades, closely followed by Maths with 73% A*/A. Equally, in creative subjects such as DT and Art, Warwick students were awarded an impressive 73% A*/A grades, whilst English Literature results of 63% A*/A included, Harry Jenkins, Warwickshire’s Young Poet Laureate 2017, who received A*A*B. Not to be outdone, 73 students in Year 12 also demonstrated their research skills, achieving exceptional results in the Extended Project Qualification, with 88% A*/A grades. Having led Warwick to victory in this year’s NatWest Schools Cup, Nicky Rigby (AAB) and Nick David (A*AB) can both celebrate A Level success whilst away in South Africa, touring with the England U18 rugby team. They will both take up full-time contracts with Worcester Warriors next season and yet their academic successes, like those of their peers, prove that, with the right work ethic and support, young people can achieve remarkable things academically alongside a serious commitment to sport, music, drama or other activities. It is essential that education in Britain remains broad and balanced, giving young people not only the qualifications they need, but also experiences that will challenge and inspire them. Head Master Gus Lock commented, “I am truly delighted with these excellent results, which are, once again, a fitting testament to the incredible hard work of the boys and their teachers, as well as a reflection of the tremendous support from their families and from each other. We wish them the very best as they move on to universities, apprenticeships, gap years or wherever their future takes them.